An US company is considering producing electronic implants that could be used to keep tabs on kidnap victims via satellite. Originally Applied Digital Solutions had intended to market its VeriChip to patients who wanted to keep their medical records under their skin. But recently the firm has caved in to pressure to include tracking devices. "If a market demand exists for an implantable GPS (Global Positioning Satellite) device of some kind, which now seems to be the case, the company will try to meet that demand," said a spokesman for Applied Digital Solutions. "There seems to be a pressing need for this kind of product to stem the tide of kidnappings in Latin America. So we're very interested in responding to this demand and to help save lives," he said. The VeriChip is not yet available as it is pending US Government approval. But as chip implants designed for medical uses mutate into tracking devices, the debate about how good the technology will be for us is being reopened. 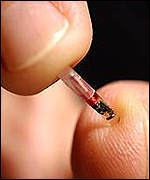 Would you want a chip implanted? Once the technology has been developed it will not be easy to stop it being used for surveillance purposes believes Ian Pearson, BT's futurologist. "You can't put the cat back in the bag. It depends on whether governments want to increase surveillance rather than on the technology," he said. For head of Privacy International, Simon Davies, the closer relationship between the body and technology is not a happy one. "The intimacy between technology and the flesh crosses a line," he said. "My instinct tells me this is an entirely unnecessary and dangerous technology." But some may see tracker chips as a positive development. After 11 September, many western governments have become paranoid about security and want to keep a closer eye on citizens with schemes such as national ID cards. "You can't get a better ID card than one you can put under your skin," points out Mr Pearson. The technology necessary to locate a person geographically is not particularly sophisticated. It has been around for years in the chips that are implanted beneath the skin of pets. But chips are set to get a whole lot more complicated. Chips that monitor blood chemistry are already being made, as are ones that can be connected to the nervous system to allow movement in limbs that have been damaged. The next stage would be making chips that can interpret sensations and connect people that are physically removed from each other. "There is no reason why you couldn't shake hands across a network or make love to your boyfriend," said Mr Pearson.